Established in 1968 the Townsville Branch has a long history of caring for our local environment and encouraging the community to understand and appreciate the wildlife and natural places that exist within our city boundaries and immediate surrounds. Of special interest are the health and management of nearby national and environmental parks (such as at the Town Common or on Magnetic Island). We have also been active in encouraging science-based and humane management of wildlife in urban settings and promoting better understanding of their conservation needs. Further afield the Branch has a strong interest in the protection of coastal woodlands and rainforest, the protection of Hinchinbrook Island and Channel, and broader coastal, reef and land management issues. It is an advocate for the conservation of threatened species such as the dugong, snubfin dolphin, mahogany glider and cassowary. The Branch runs a program of field trips (at which non-members are welcome) to places of interest around the district in order to enjoy and learn about our natural environment. It is currently engaged in a monitoring project for the endangered mahogany glider north of the city. Please contact us for further enquiries or information about any of the above. 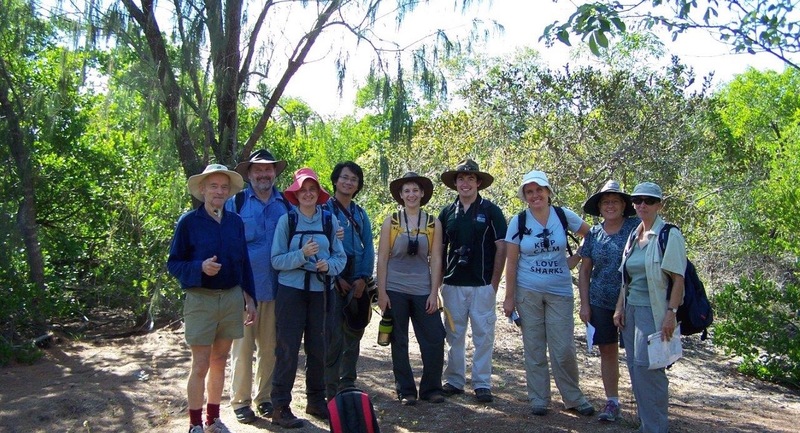 Branch members in the Cape Pallarenda conservation park. Photo Laurie Hall & Malcolm Tattersall. Dates for 2019 field trips are: 24 February, 24 March, ? April (tba), 19 May, 23 June, 21 July, 25 August, 22 September, 20 October, 24 November. (These are not set in concrete – occasional changes may be made). Our AGM will be held on 30 March. Meetings For other events and news ask to be added to our email list or sign up, via the box at left, to receive automatic notification of new posts. NB: FOR INJURED OR ORPHANED WILDLIFE PLEASE CONTACT NQ WILDLIFE CARE ON 0414 717374. 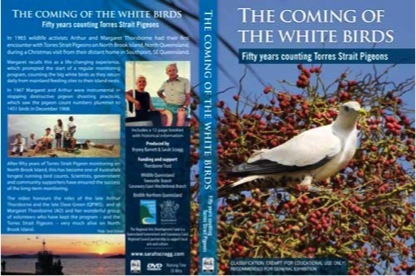 We have FIVE copies left of this 26-minute DVD and booklet which documents the story of the Pied imperial-pigeon colony on North Brook Island (east of Hinchinbrook). EMAIL US now to order your copy, $15 each (free local delivery or add $5 postage). All profits go towards keeping this important project alive into the future.